Sandro Gamba discovered Pino Brumatti in Gorizia. The young gunner, who eventually developed a terrific jump shot, stopping on a dime, was nervous, didn’t play well and convinced Olimpia’s superscout only after he attended a game without being spotted. Gamba says that Brumatti cost him a Rolex, the one he threw away disappointed after a bad practice. 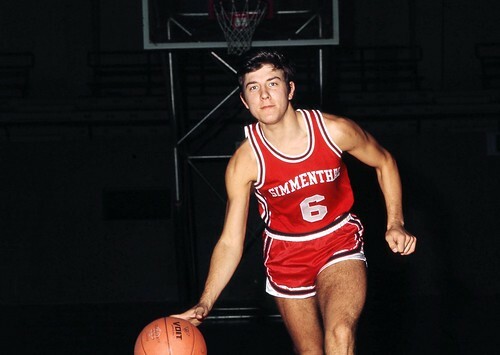 But Brumatti overtime became a great player, a shooting guard unstoppable offensively, generous and capable to form with Giulio Jellini one of the most efficient back-courts in the history of Italian basketball, with the Simmenthal jersey. Brumatti was one of the players that played three tie-breaking games against Ignis, winning one, but winning also three Cup of the Cups and one Italy Cup. He’d have won more if he was born earlier or later. He peaked when Olimpia was in the middle of the rebuilding years and he was traded – after bringing Olimpia back to the top league – to Torino (competing against Milano for many years) and the played in Siena, Reggio Emilia, Verona. Pino Brumatti, who played ten seasons in Milano, died in 2010 at 62. He played 102 National team games, scoring 507 points and taking part in two Olympics, 1972 and 1976, finishing fourth and fifth respectively.